In 1996 I published a seven-hundred page book on the history of the Hare Krishna Movement in Australia entitled The Great Transcendental Adventure. 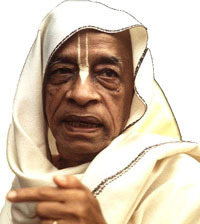 The book also serves as a biography of the movements founder and Acharya, His Divine Grace A.C. Bhaktivedanta Swami, affectionately known as Srila Prabhupada (1896 - 1977). Today is the birthday of Srila Prabhupada, and in every Hare Krishna Temple around the world, a festival celebrating his great life and contribution to the world is in progress. I'm at the North Sydney temple today cooking a 10-course feast for my eternal spiritual master Srila Prabhupada, and 700 guests. Submitted by p.n.v.pavankumar on Sat, 2012-08-11 13:45.